Born in 1967, he completed his BFA and MFA in Painting from the Faculty of Fine Arts, MS University, Vadodara. He has participated in many exhibitions in New Delhi, Guwahati and Mumbai, including The Harmony Show 2000 and 2001 in Mumbai. He has held solo shows at Lakeerein – The Contemporary Art Gallery, Prithvi Gallery and The Guild in Mumbai, and the State Art Gallery in Guwahati. A recipient of the Assam Government Scholarship (1986-92), he bagged the Emerging Artist of the Year Award at The Harmony Show 2000. He has also won scholarships from AIFACS and UNESCO-ASCHBERG Bursaries, the latter to work at the European Ceramic Work Centre, Netherlands. Nikhileswar Baruah remembers his childhood days in Guwhati quite clearly. The picturesque state, now ripped apart by violence, in fact finds its way in his works quite often. He comes from a family with a background in theatre. "But I liked painting right since childhood," he recalls. "And no one in my family tried to divert my attention to any other art form. I knew I would be a painter." After completely his 12th standard, Baruah joined the M.S. University Baroda to do his Bachelors and then Masters in fine arts. 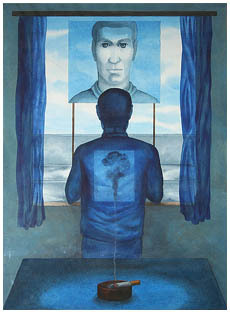 In 1992, he took up a job as a lecturer in the University's painting department, which he quit only recently. Baruah mostly works with watercolors on paper, a medium he says, "which is very flexible and allows you to experiment." His works reflect the agony and trauma of every sensible, secular Indian who is appalled by the violence and strife that's torn India apart. Hailing from Assam, the artist himself has seen the effect of this violence and strife. "I have lived through it in my younger days," he simply states, "so I know the effect it has on people." His works over the last few years have all concentrated on modern man's apathy to the growing violence. The repetition of events and history is a recurring theme in Baruah's works. Last year, disturbed by the plunging India Pakistan relationship and the specter of an insecure subcontinent facing the threat of a nuclear war, the artist painted around this theme. 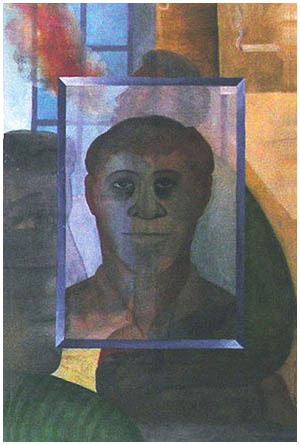 Baruah held his first exhibition in Mumbai in 1995. In 1997, he followed it up with a solo show at Prithvi and then in, 2001 at Lakeeren. Besides that, he has shown extensively in group shows at Baroda. He was honored with the Artist of the Year award at the Harmony show in 2000, besides which he won the Unesco scholarship to for the European Ceramic Work Centre, Netherlands. Nikhileshwar Baruah lives and works out of Baroda.